On the 15th day of the 7th lunar month, which this year falls on Sunday, August 17, 2016, Chinese people begin the almost month-long celebration of Ghost Month, kicked off by Ghost Day, also known as Spirit Day, or more often, as Hungry Ghost Day. Yu’s New Beijing in Glen Ellyn is happy to share Chinese traditions with you. This is a joyful holiday when the souls of the departed come to visit. Families prepare elaborate dishes to welcome the departed and to enjoy some themselves. 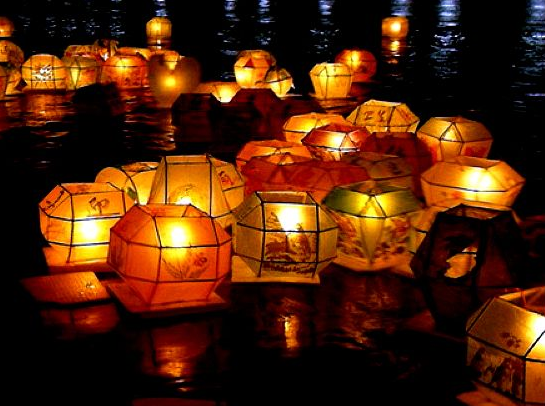 At night, colorful lanterns holding candles float adrift down streams and rivers to help the souls go back from where they came. Just as with any tradition, there are some customs that have been passed on from generation to generation. For example, during this time, first rows in theatres should be left empty, so that the visitors can have the best seats in the house. During the night, however, you should not turn if someone calls your name from behind, or tap your shoulder while you are walking. Throughout Asia, this celebration brings families together as they participate in festivals, or simply eat at home. At Yu’s New Beijing we hope that you will come over to celebrate with us and feel like you are with family. Yu’s New Beijing is open seven days a week. Our wholesome Chinese food cooked fresh every day is available for dining in, for carry out, or for delivery. 630-469-1535. This entry was posted in Chinese Festivals and Holidays and tagged 15th day of the 7th lunar month, 2016, 630-469-1535, August 17, Chinese culture, Chinese Festivals, Chinese Restaurant, Ghost Day, Glen Ellyn, Hungry Ghost Day, lanterns drift down the river, lots of food, New Beijing, Spirit Day, Yus. Bookmark the permalink.